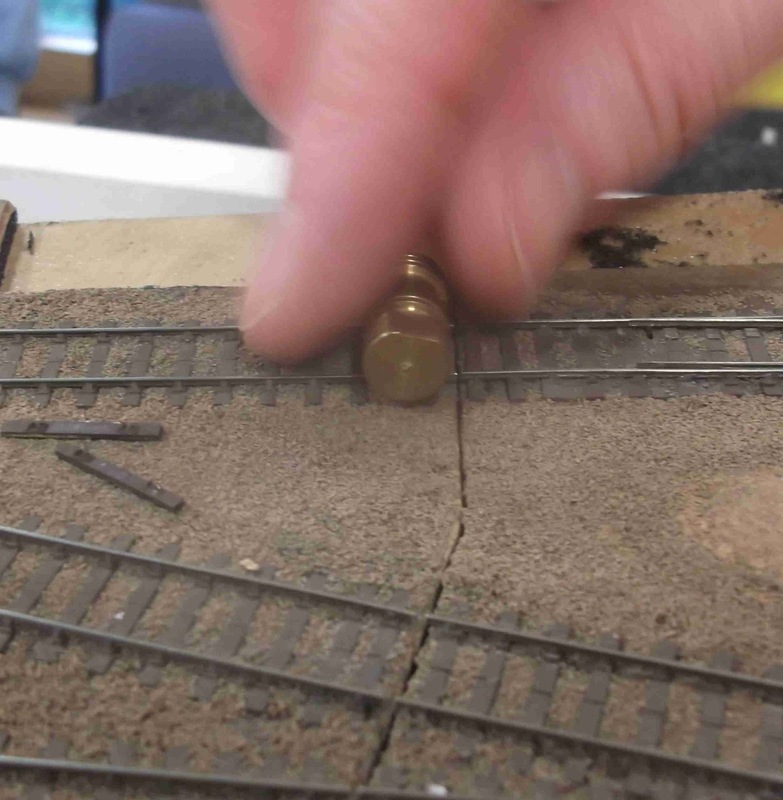 This month's meeting was disrupted by bad weather. 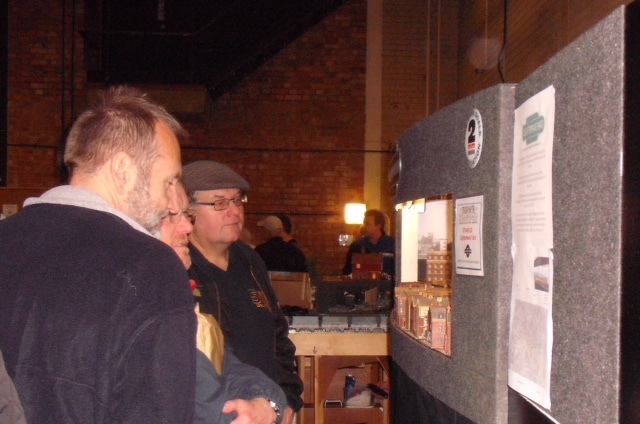 Those from Kent and from just north of the river made it, but the North West London contingent was snowed and iced in! 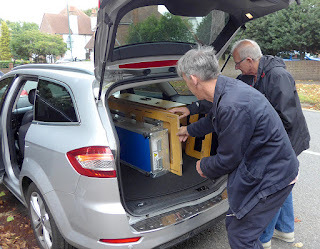 As a result there was no camera available to capture the event. 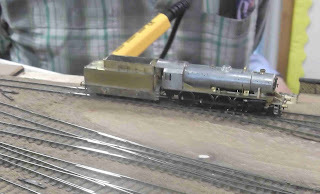 Keith and Alan both brought along partly built Somerset & Dorset 7f locos they are working on for a joint venture of theirs. 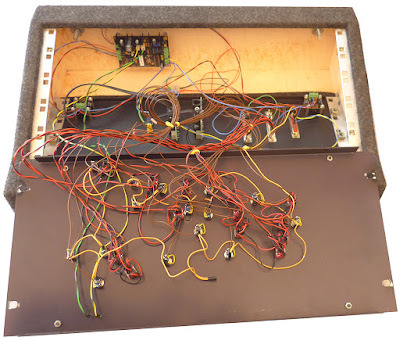 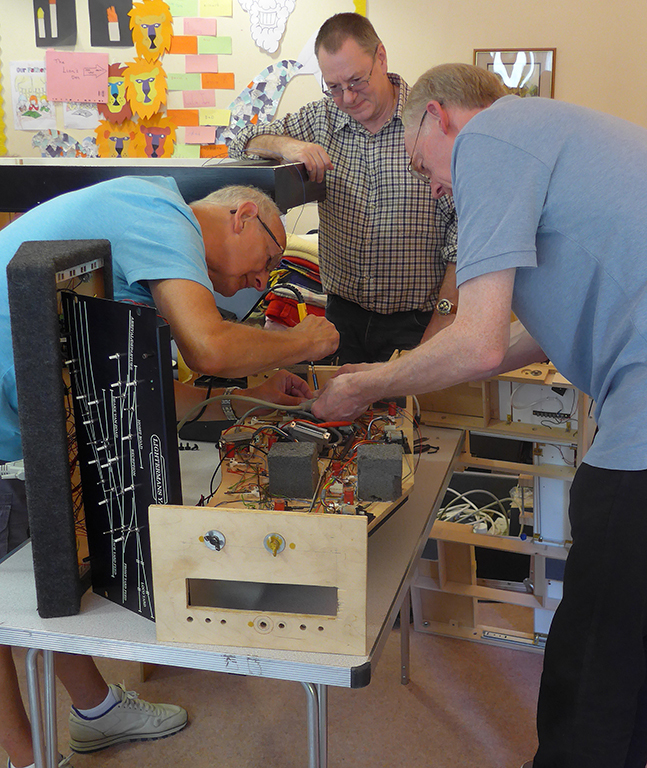 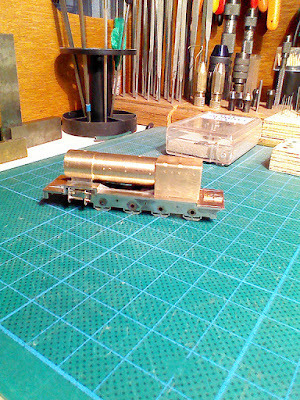 David Smith brought along a Bob Jones Black Five that he is building. 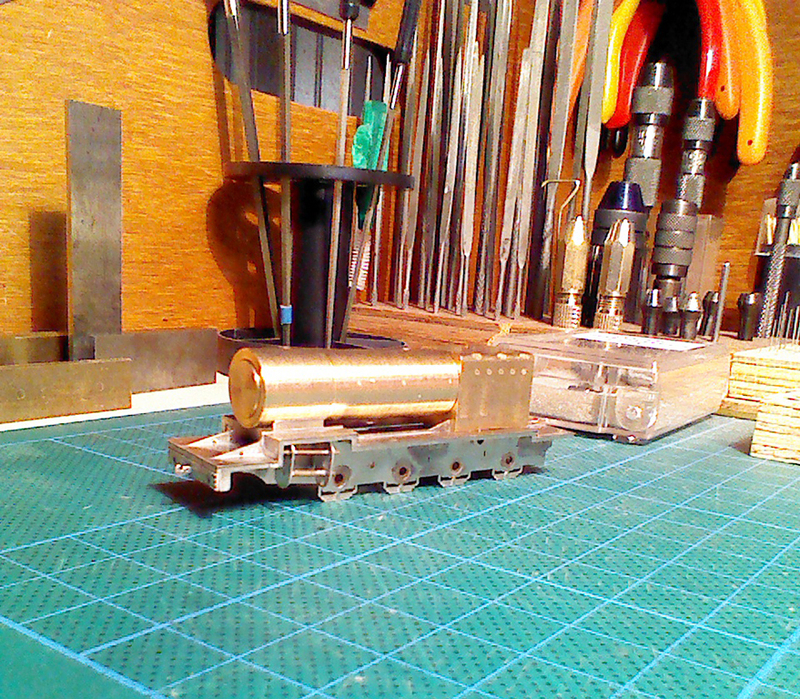 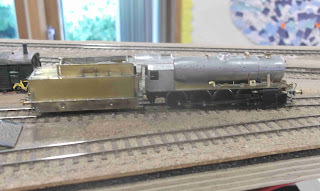 David’s loco is just about ready for the paint shop “once the weather warms up a bit”. As someone remarked, the table looked like Barry scrap yard with all the loco bits and pieces everywhere. 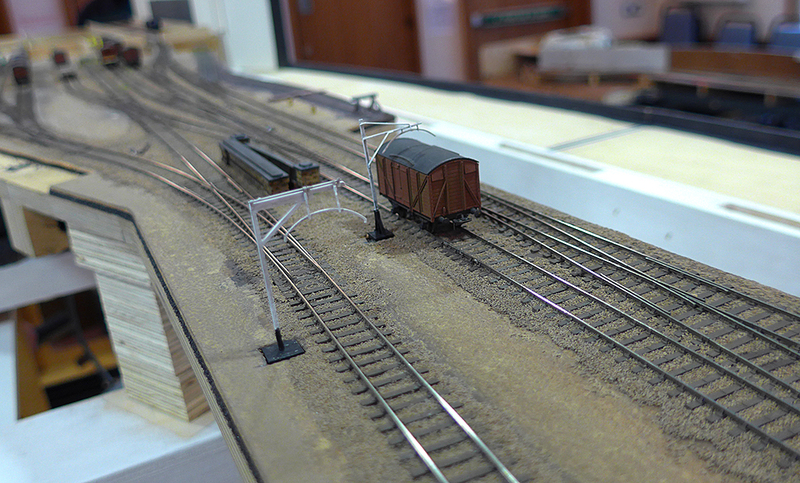 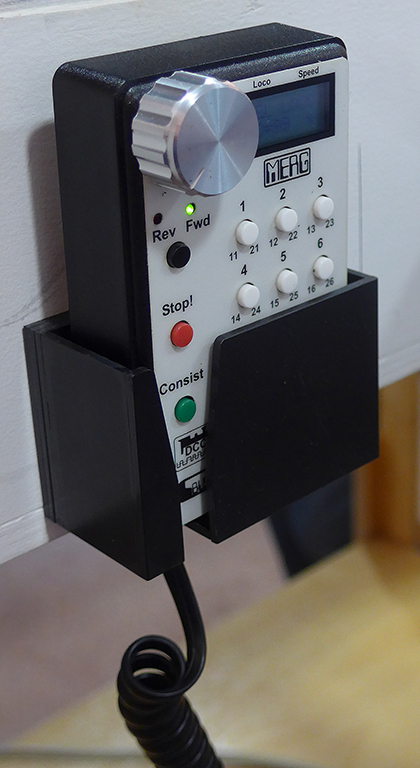 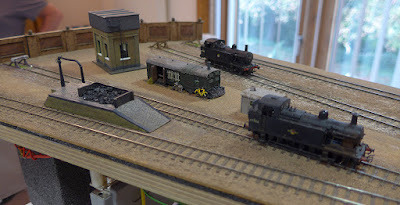 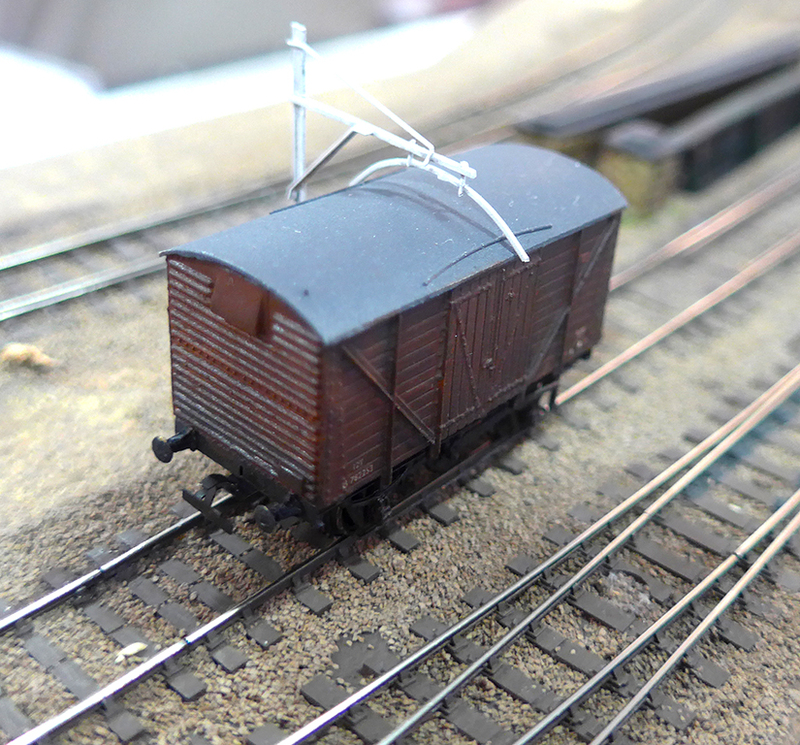 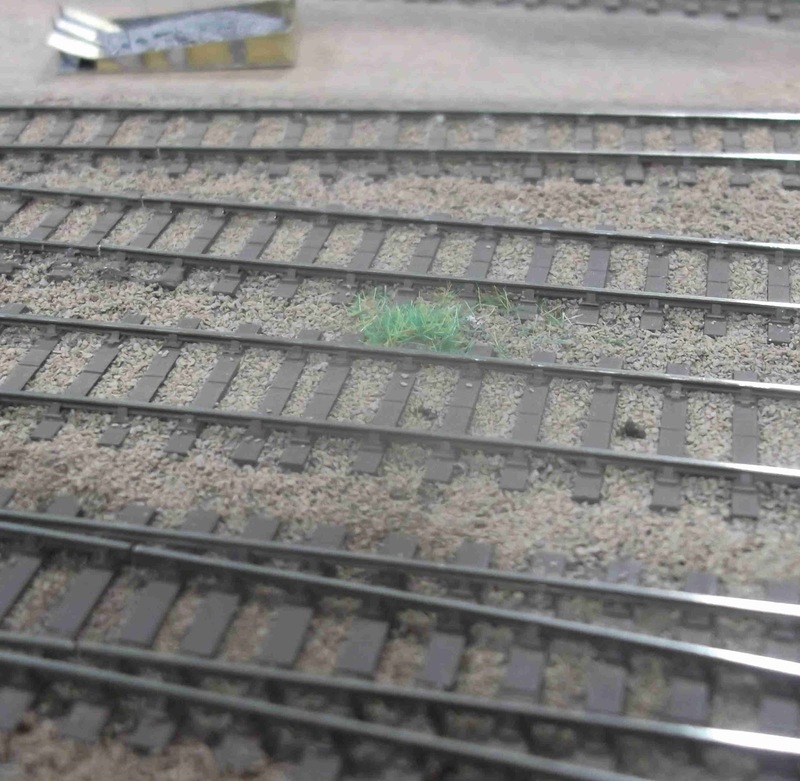 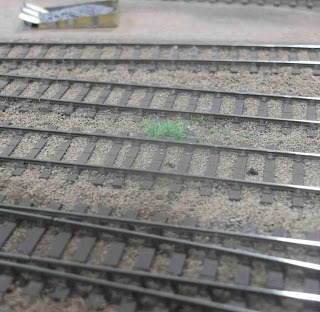 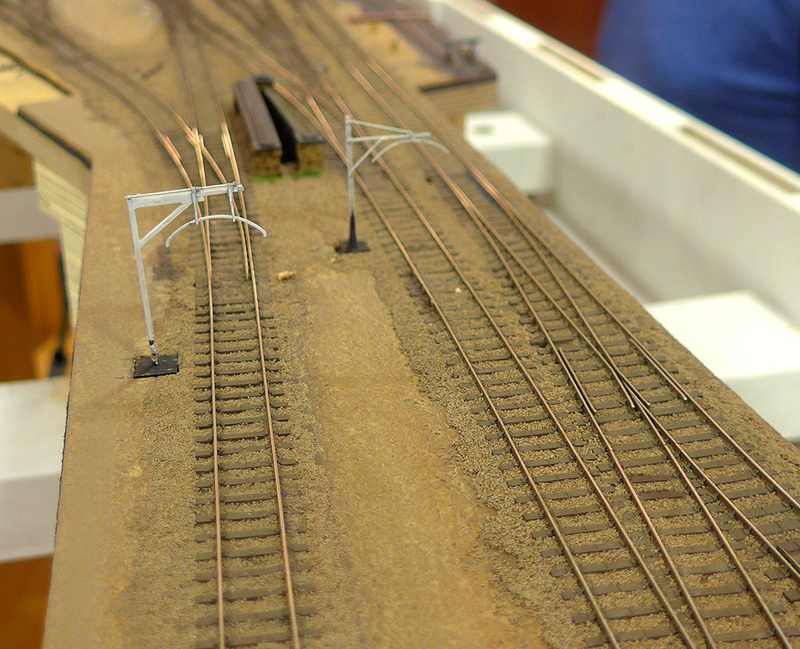 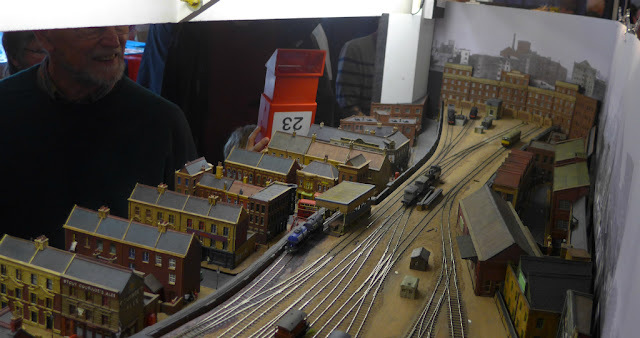 The “N” gauge lads said they had been rattling around in the meeting hall for the last two months without us there. Nice to know you’re missed! 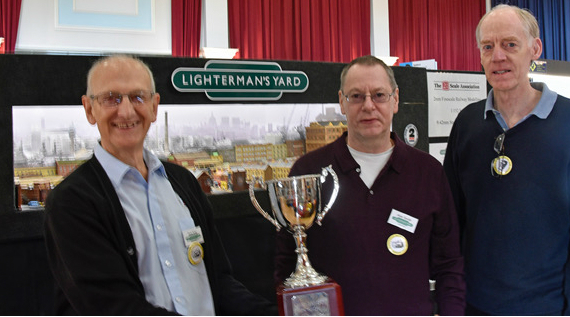 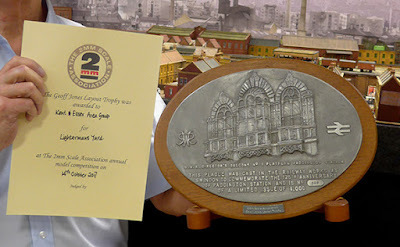 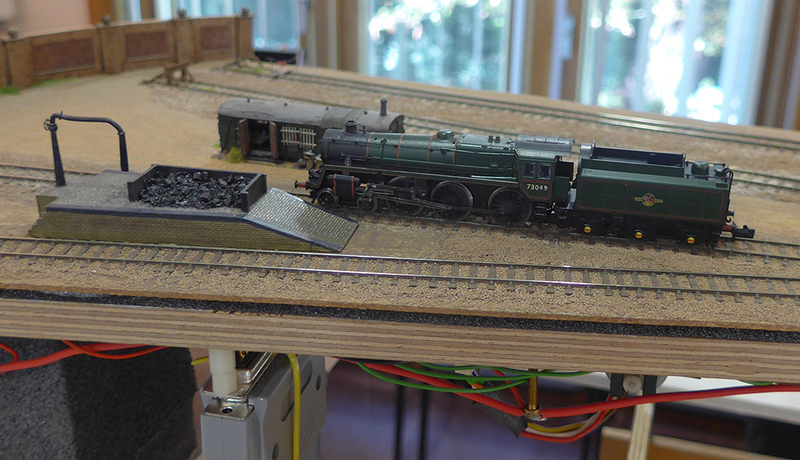 At the Farnham show we were judged by the public the second best layout in show, and at the 2mm AGM we were surprised and delighted to be awarded the Geoff Jones Layout Award (left). At the Uckfield show we became the first winners of the Keith Nock Trophy (above), voted by fellow exhibitors. 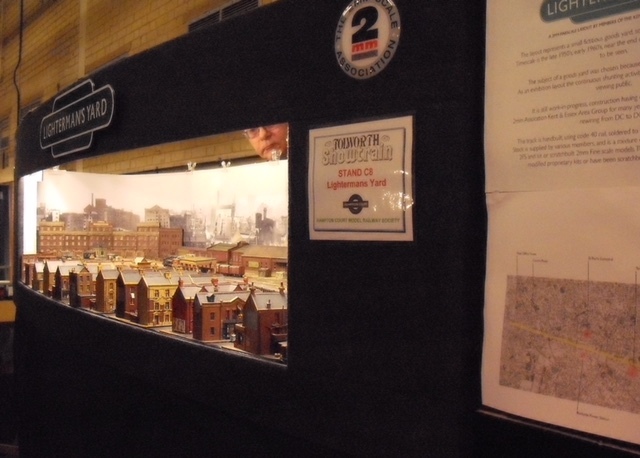 We also came in second best layout in show, by public vote. 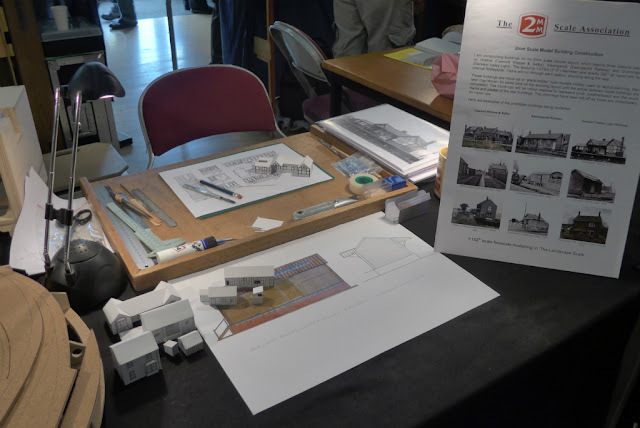 At Farnham/AGM we introduced the missing building. 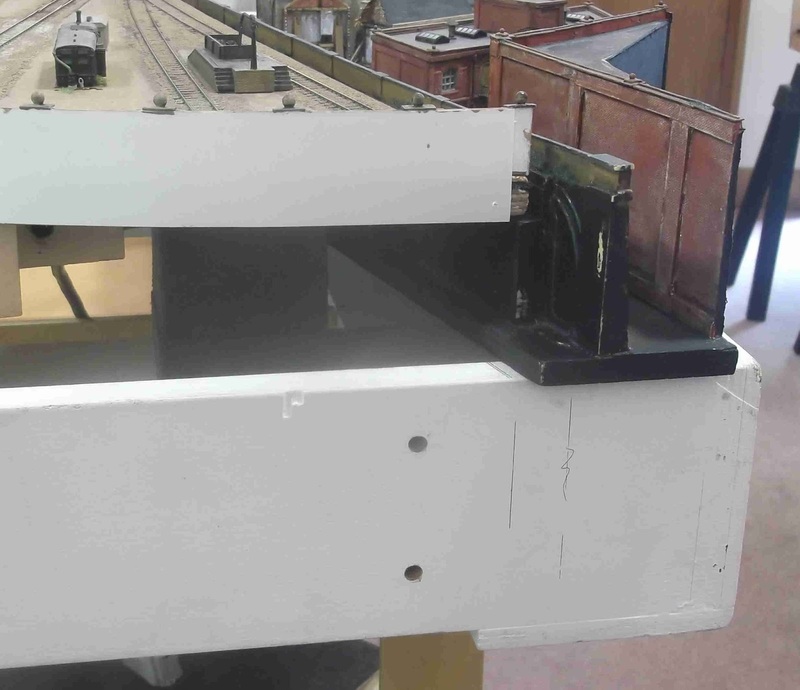 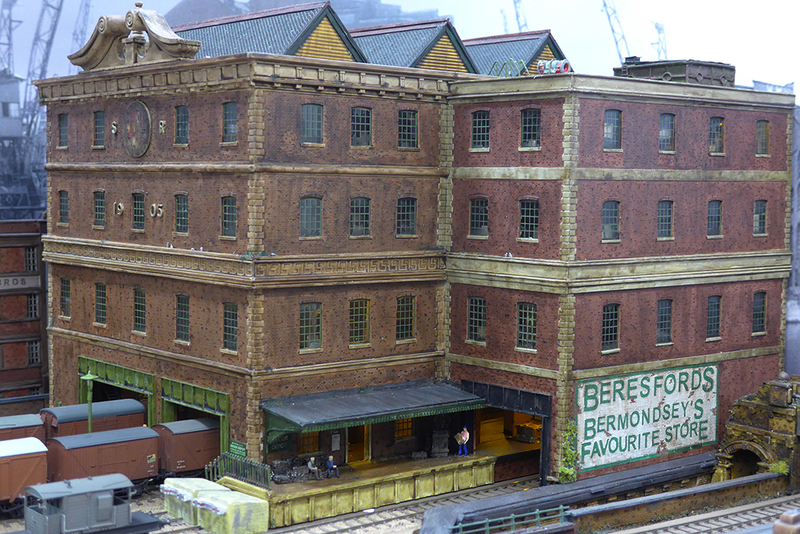 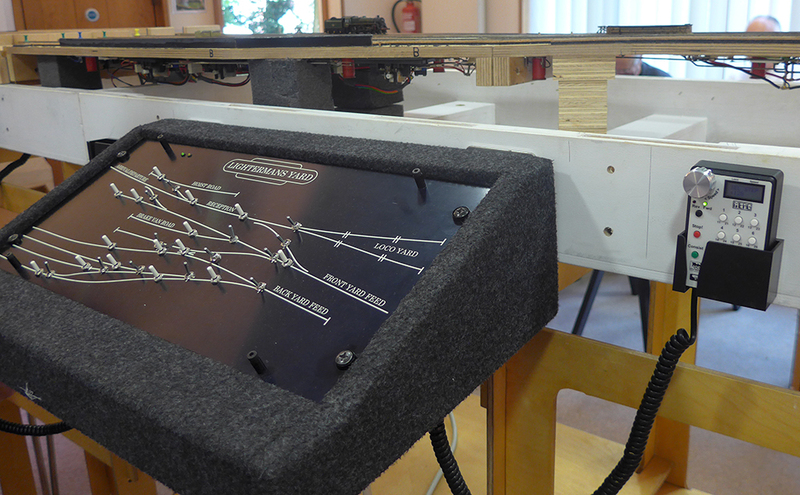 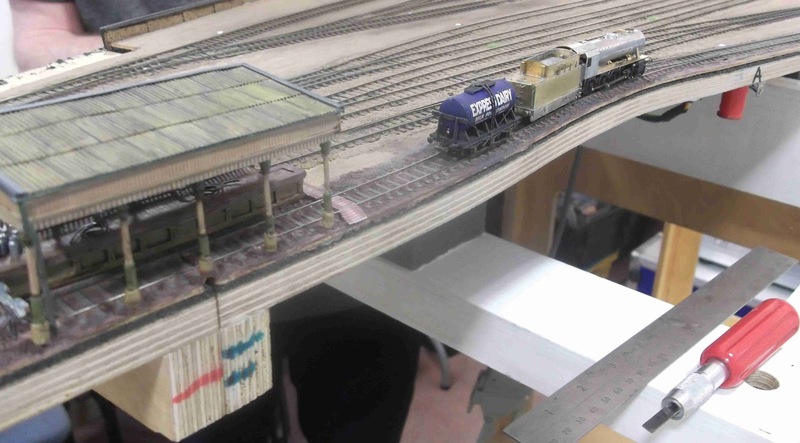 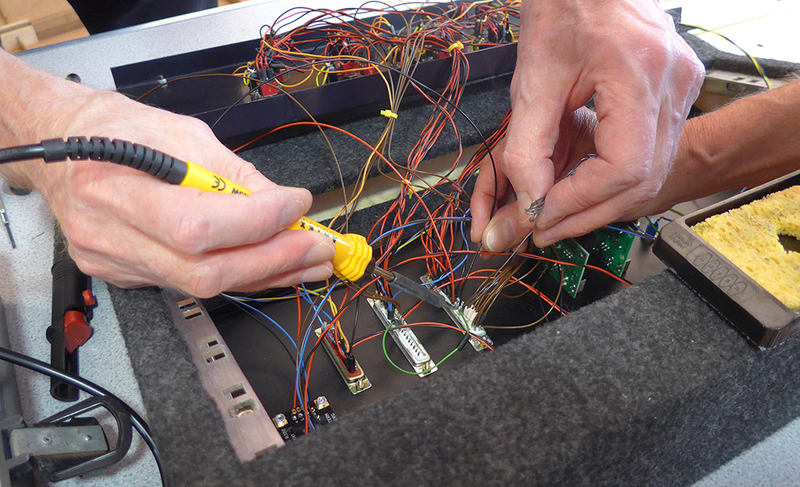 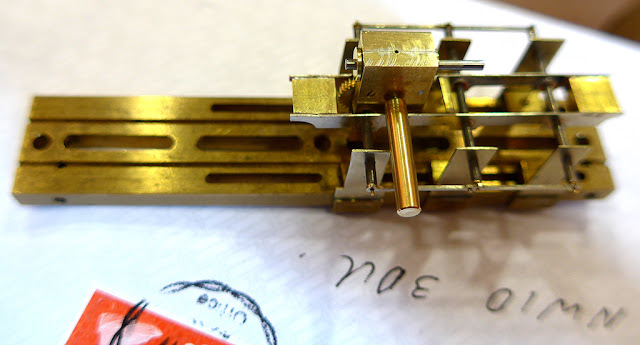 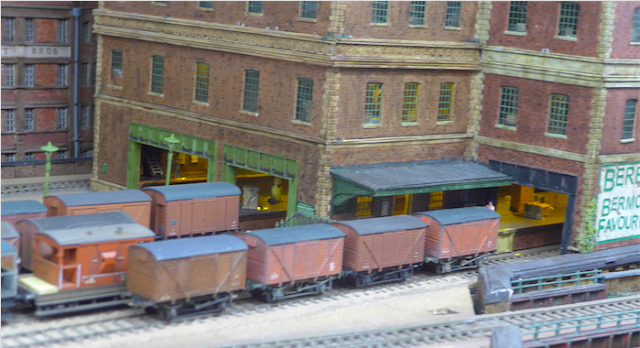 Pete Townsend had heroically taken the task of completing Berisford's warehouse away to Somerset allowing us to operate a more realistic train distribution and assembly. 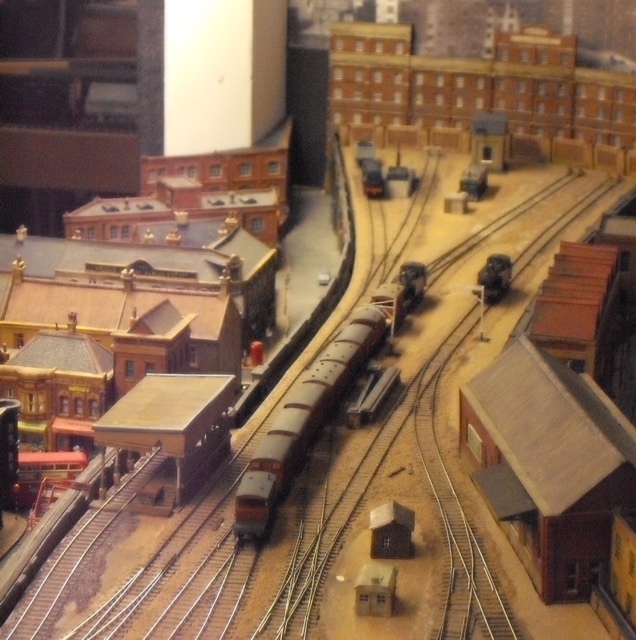 As a festive contribution, here is a 3D rendition of Lightermans Yard. 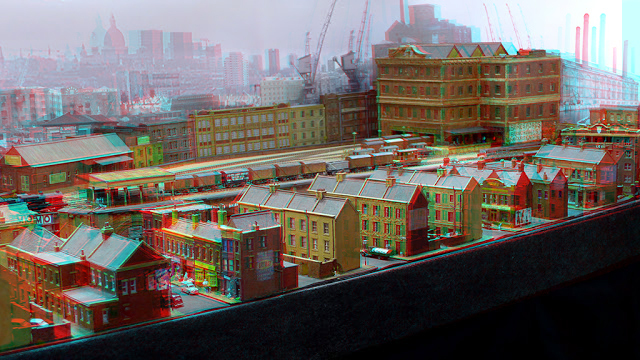 You will need red/blue 3d glasses (remember those?). 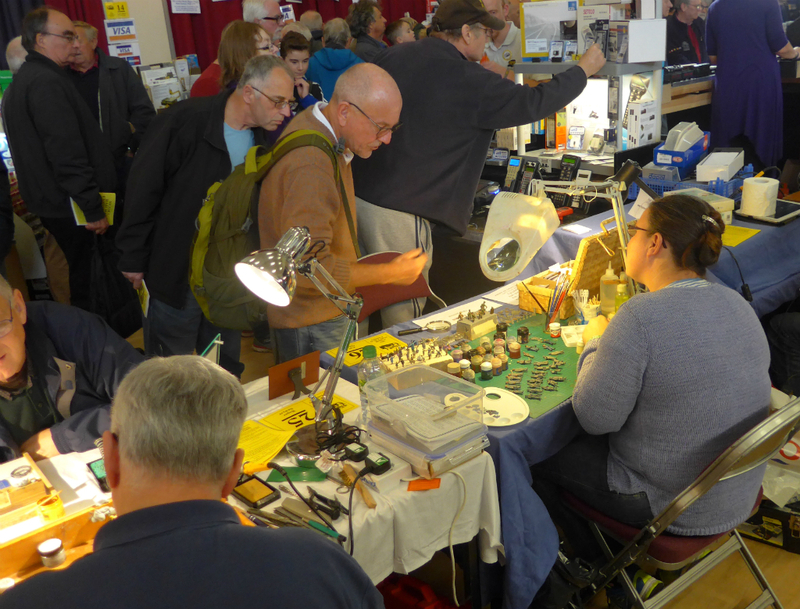 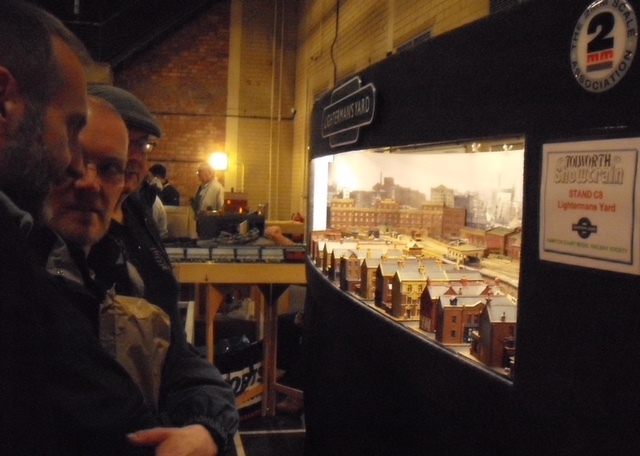 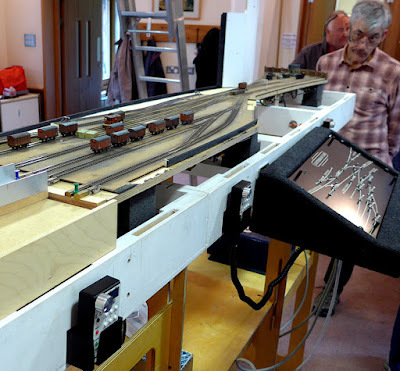 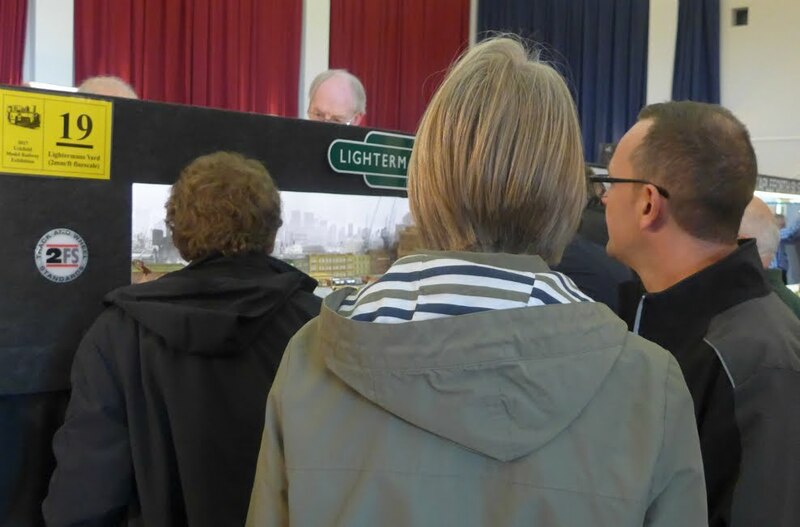 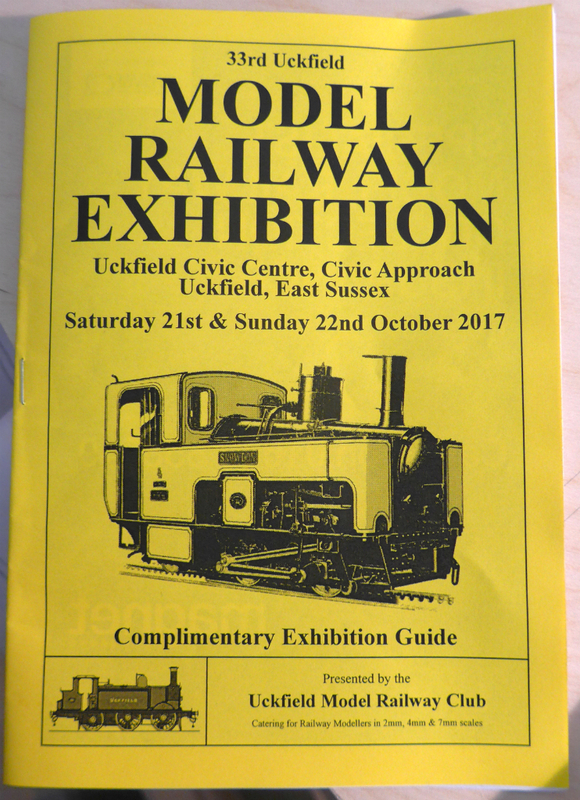 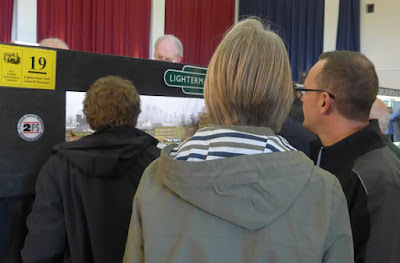 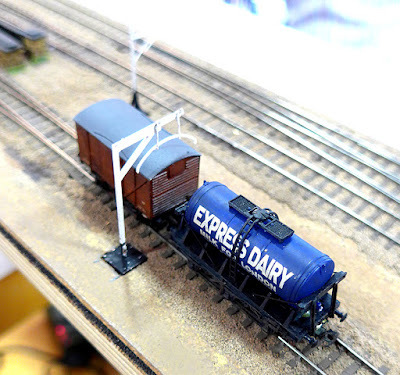 Yet another regular meeting was replaced by an invitation to exhibit, this time at the Hampton Court Model Railway Society Exhibition at Tolworth on November 11th and 12th. 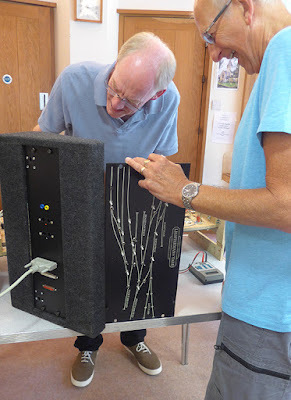 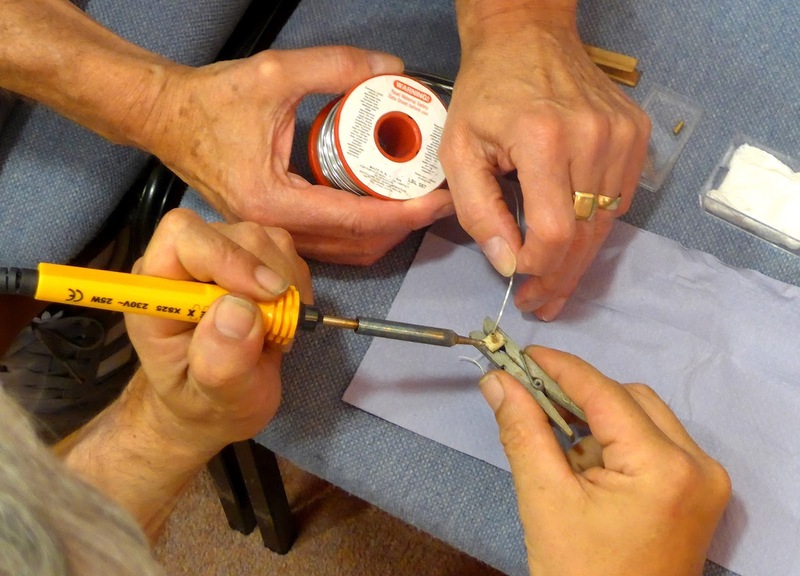 Setting up, by Keith and Pete K, was on Friday evening and went smoothly and without fuss. 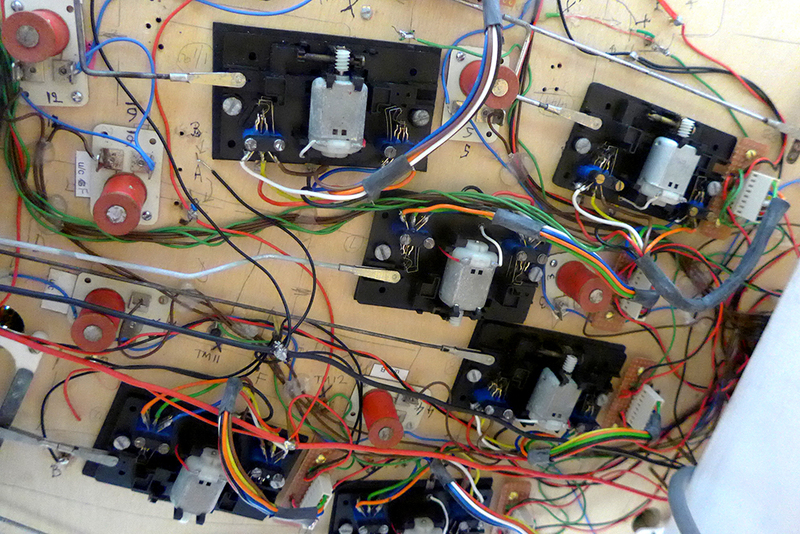 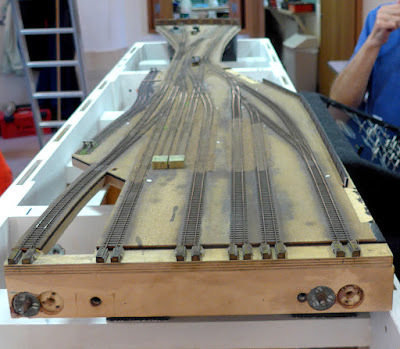 All the trackwork was cleaned and found to be in working order. The Yard was then put to bed for the night. Saturday morning Keith and Pete K arrived expecting to be the only operators for the day but while enjoying a cup of tea a knight in shining armour was seen in the shape of David S.
After a few hours of good running one of the points developed an electrical problem. 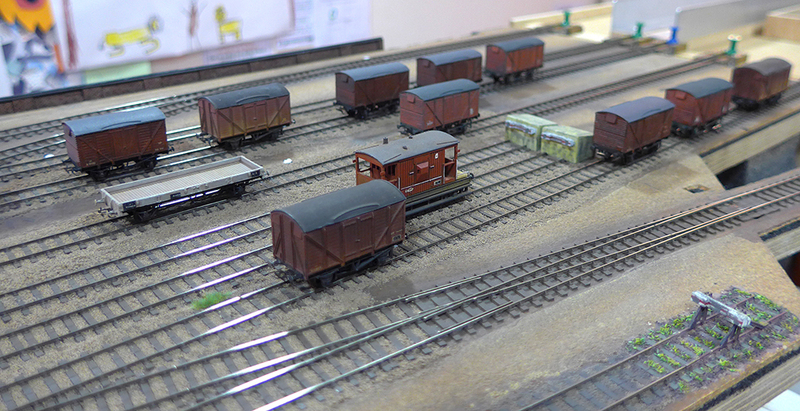 It would allow access to the brake van road but not ahead through the run round loop, needed for forming departing trains. David S again came to the rescue by prodding around in the dark under the baseboard and curing the problem for the rest of the weekend. 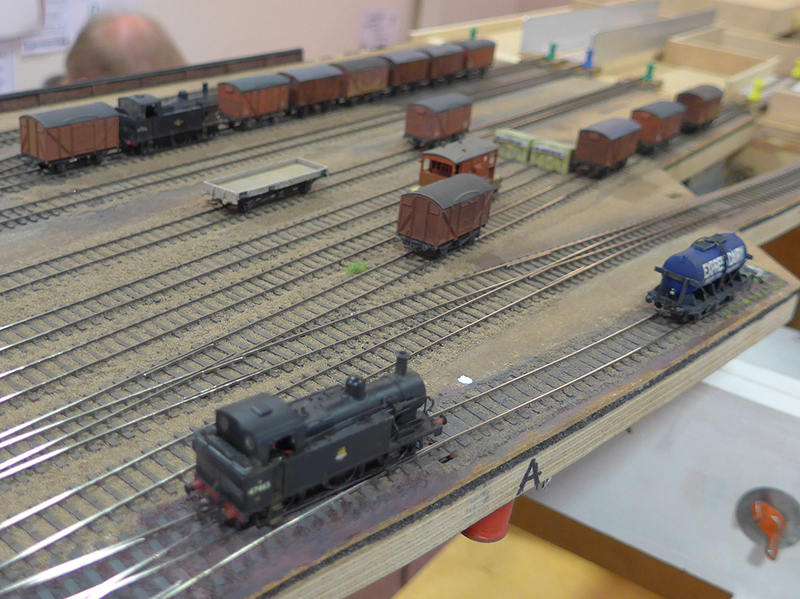 Sunday, the staff was Alan, Keith and Pete K who enjoyed a good day of running. Alan over the top again! Throughout the weekend the viewing public were making very complementary comments about the layout which is always good for lifting the spirits when tiredness begins to set in. 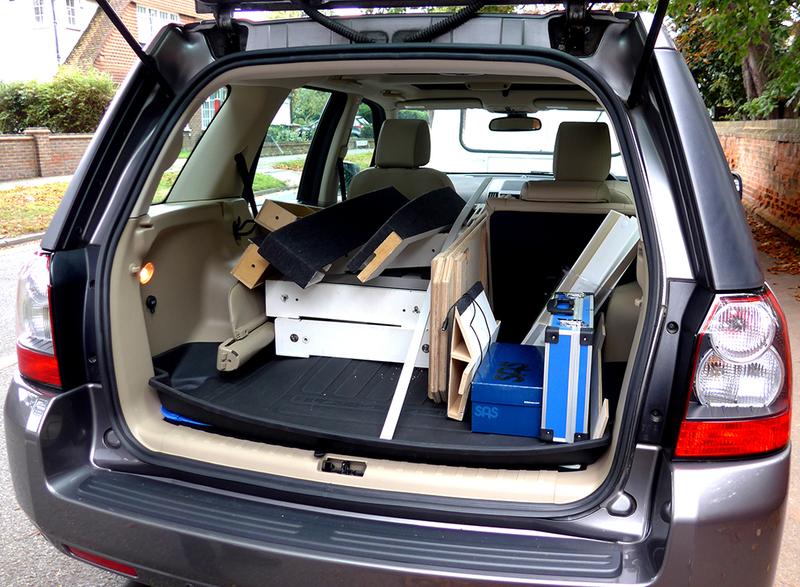 After the show everything was packed away and ready to go in what may be a new record time of around 30 minutes. The next showing will be Crawley April 2018 so that should give the team time to catch up on some of those “little” jobs that we never seem to get round to. 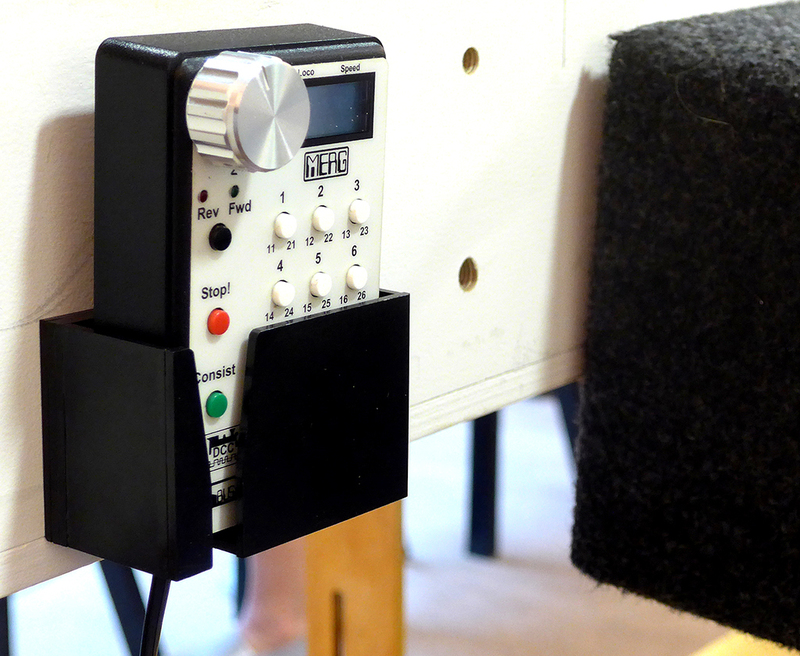 Thanks to Pete King for this report and pictures.